Don't do these 5 things! I'll show you all of the tweaks you need to make so you sound better and play better! 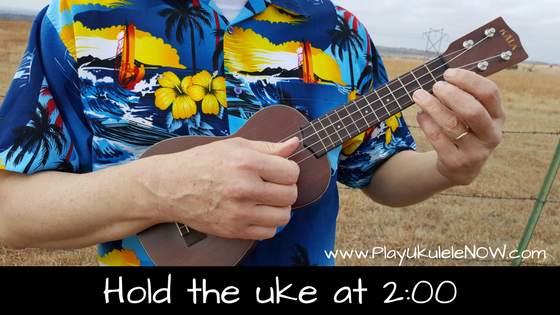 Here you'll learn how to hold the ukulele correctly and get the absolute best possible sound. 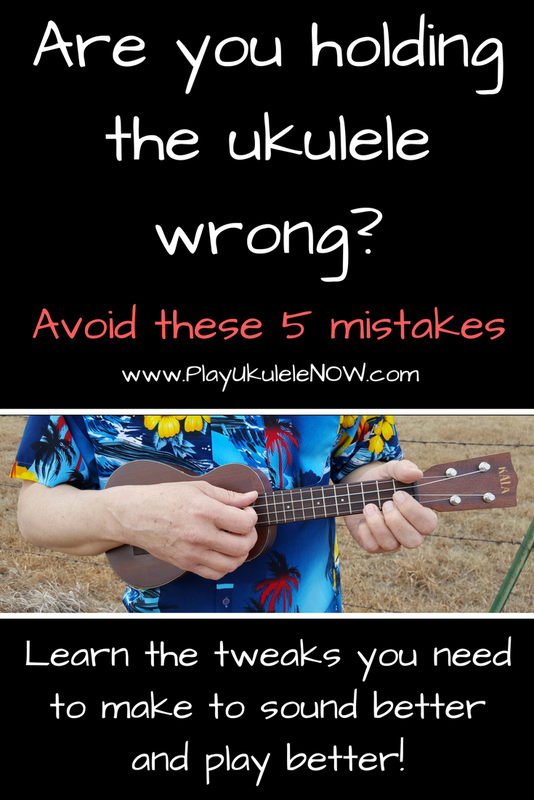 The things everyone dose when they hold the uke will no only make it harder to play - they will also mute the instrument so it doesn't sound as good! 5 of the mistakes most people make are shown here. If you look at the picture, it looks like how most tell you to hold the instrument doesn't it? 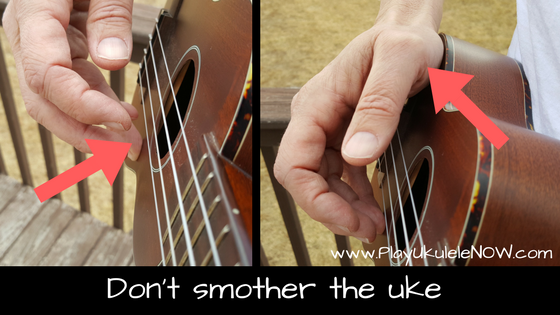 If you hold the ukulele this way it will be harder to fret chords, especially in more complicated arrangements, harder to play any more complicated right hand techniques and you will be smothering the instrument, greatly reducing volume, tone and projection! Place the thumb in the middle of the back of the neck and use your fingertips to fret the chords. When moving throughout the neck the left hand should pivot on the thumb making it allot easier to move around. If your thumb is over the top of the neck or to high up on the back of the neck movements will be sluggish making complicated arrangements much more difficult to play. Look below at how the hand pivots on the thumb while playing this part from O Come All Ye Faithful. Use your fingertips to fret the chords - you will need to cut your nails on you left hand. The closer you come to parallel with the fretboard the more you risk touching adjacent strings with the fingers you are fretting the chords with which will create buzzing or a muted sound. Only your thumb and fingertips will touch the ukulele. Do not cradle or cup the neck with your left hand as shown here. 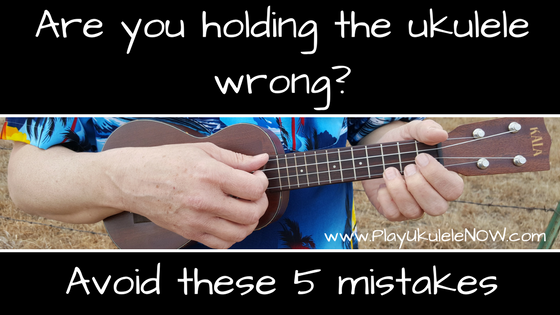 You'll often see it recommended to hold the uke at 90 degrees. This makes proper left hand and proper right hand position more difficult or impossible. Notice the uke is held at about 2:00. This makes it allot easier to reach with the left hand, and makes proper right hand position much easier. Your hand should come over the top at a slight angle as shown here. 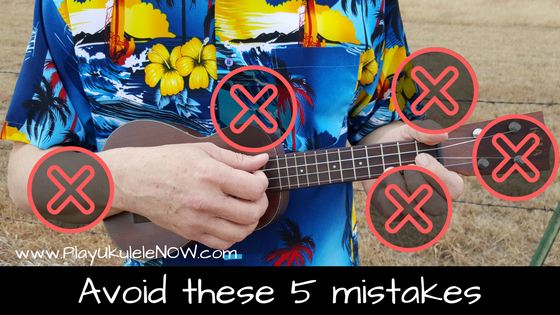 Notice the arm dose not touch the top of the uke, it dose not lay across the top of the uke. 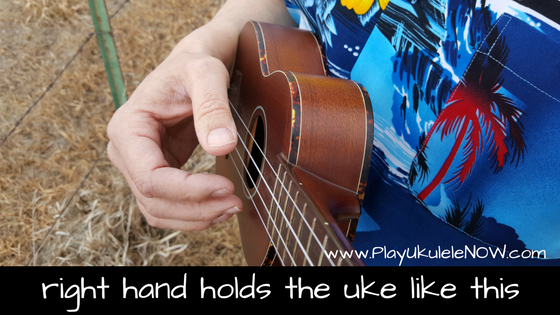 The uke is held at the edge of the instrument by your forearm. Also notice the thumb is in the middle of the back of the neck and the fingertips are used to fret teh notes. 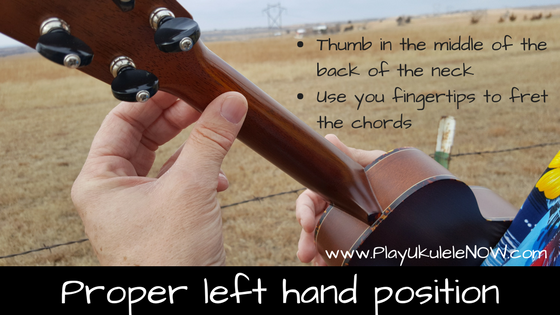 The exact position of the right hand will vary for fingerstyle and strumming. For strumming you will want to strum at the 12th fret, or where the neck meets the body. This is where there is the least amount of tension on the string and where you will produce the warmest sound. Strum so that your fingernail gently brushes across the strings. Try this: Strum closer to the bridge and right next to the bridge and listen to the difference in sound. This is an effect that you may want sometimes! For fingerstyle playing you will want the right hand to be closer to of over the soundhole. you can adjust the position to your taste to to adjust the tone. Hold the ukulele is such a way that you hand is just above the strings. Notice the instrument is held in place by the arm only - the right hand is just above the strings. This is something I see everyone do, and it's rarely talked about. Make sure your right hand dose not lay on top of the instruments at all, as indicated above. Make sure you do not hold the instrument against your body. The uke needs to be able to vibrate to project the sound. If you do either of these things you are smothering the instrument and muting the sound. Hold the uke away from your body as shown above. You can absolutely kill the sound by doing these things. As you can see in one of the examples the right hand rests on the top of the instrument, preventing the top from vibrating. The top needs to vibrate to produce and project the sound. The other example, the finger on the top, isn't quite as bad but it has two major disadvantages. Not only are you preventing the top from vibrating, your also preventing the right hand from moving freely and a relaxed manner. 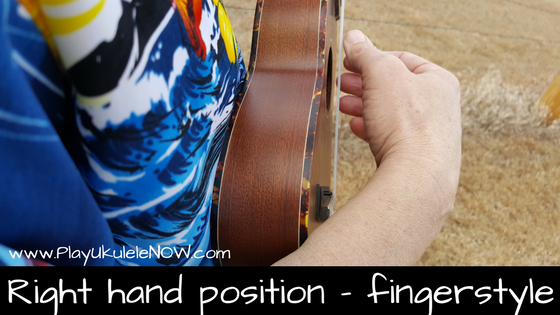 If you can already play some fingerstyle try this: Play an arrangement the right way, holding the ukulele as indicated in the fingerstyle section, then try it resting the palm your hand on the top like in the picture above. You will notice a dramatic difference in sound. Let as much of the wood surface as possible vibrate to get the best possible sound, volume and projection. Take a deep breath and relax before you play. It's important that your right and left hand are as relaxed as possible. Thanks for the tips, excellent article. When I change chords my uke moves around and I have to readjust and this, of course, messes up the beat and I end up dropping a beat or two. Any tips? Linda: The left hand position indicated here is essential for more complicated passages, but it is acceptable to cup the neck when playing basic chord changes, and switch for more demanding parts. 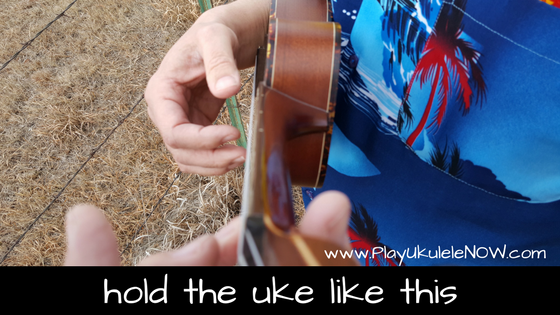 More advanced players should try to hold the uke firmly with the forearm, as shown here, and pivot on the thumb for all chord changes, This may require some practice. 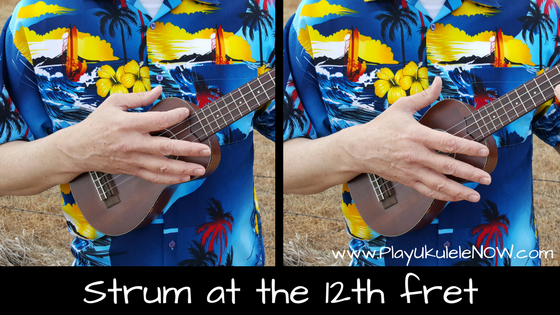 Try applying more pressure with your forearm to better hold the uke in place. You could apply more pressure during the chord change only, and less pressure while strumming the chord. 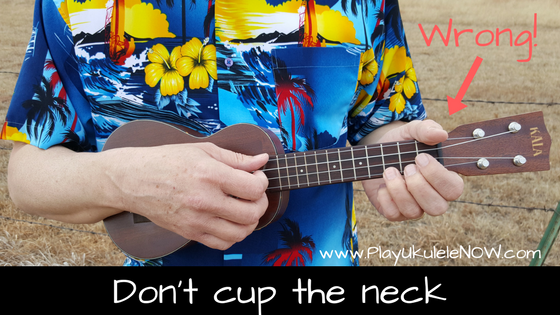 It's not easy, and playing the uke without a strap is a bit of a balancing act! A beginner can cup the neck, if playing basic chords in an open position, and switch for more complicated passages. You could use a strap, a classical guitar strap will work great for a ukulele. Is this the right or left index finger? 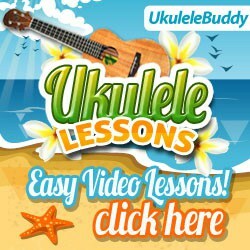 Can you post a video of you playing on the Play Ukulele Now Facebook page so I can take a look?